Charlotte is now Principal Flute of the BBC Scottish Symphony Orchestra and also plays as Guest Principal with many British orchestras. She won the Royal Overseas League Wind Finals in 2015. She is a former pupil of the Purcell School. When you go to a concert, you hope it will be at least enjoyable and, if you’re lucky, something a bit more than that. You struggle through a thoroughly unpleasant late winter day, and settle down to hear two musicians of whom you’ve not heard before. But then, within five minutes, you feel as though the sun has come out, the wind has dropped, and you just know that the next ninety minutes are going to be sheer joy; this is something special. Is this fanciful? Was there an almost tangible feeling last Sunday afternoon that, right from the start, we were in for an afternoon of great pleasure and delight? The artists who evoked this response were flautist Charlotte Ashton and pianist William Vann. They had artfully chosen a programme that stretched from Bach and Handel, through French music of Dutilleux and Widor to Bartok, Samuel Barber and the contemporary Ian Clarke. But the art was in presenting these, not chronologically as might be expected, but as they might most convincingly make their effect. So we went straight in to Dutilleux’s little Sonatine, full of French charm and gentle dissonance. Then back to Bach, whose vivid and unusual keyboard writing now seemed almost modern, and on to Bartok’s lively and colourful picture of Hungarian country life. Charlotte’s playing was of such variety and freshness that each piece seemed to bring new discoveries – amazing technical skills, a wide palette of tonal colours and gorgeous bright upper register, so that each phrase seemed to be a revelation. And she was matched in this by her partner Will who not simply supported her but seemed to urge her on through his keyboard fireworks. His ability to replicate the baroque sound on the Steinway was uncanny and sensitive, his Bartok joyously idiomatic. They made a superb duo, each alive to the other’s musicality, achieving ‘synergy’, the scientists call it, but to us it sounded just ‘even better together’. The second half brought Handel – they differentiated this from the Bach so subtly- then Barber’s Canzone, all luscious chromatic longing. Then to Ian Clarke’s amazing ‘The Great Train Race’. Which bit made you smile most? The heavy breathing? The singing (and playing)? Or the two notes played simultaneously, with both notes perfectly in tune? Whatever, it was a staggering tour de force that left us open-mouthed with amazement. Then Widor brought the concert to a close – who would have thought that a titan of the organ could write with such lightness and deft skill? A perfect way to close. Charli and Will were so pleased that so many young music lovers were present, certainly 15 but difficult to count! They will not only be the audience of the future but also the performers. They couldn’t have had a better example and introduction. What the future holds for Charli will be exciting to see. 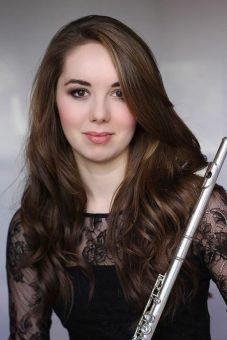 She has been Principal Flute with the BBC Scottish Symphony Orchestra for a couple of years and is on the radar of London orchestras. She had made a couple of guest appearances with the London Symphony Orchestra at the Barbican only a week before our concert, one under the baton of Antonio Pappano. Such relaxation as she gets are mainly four hours on the West Coast line between Glasgow and London. And she’s playing in four Proms this summer. Will’s prospects are equally exciting, and include his Festival Hall debut when he will be conducting Parry’s oratorio Judith on 3rd April, its first performance for 80 years. And he is Artistic Director of two music clubs, while also Director of Music at the Royal Hospital at Chelsea – he came to The Muse on Sunday straight from 11am Matins!